Building resilience is essential if households that escape poverty are going to stay out of poverty for the long-term. Findings from combined quantitative and qualitative country studies, for instance, show that successful smallholder farming is commonly woven into the narratives around sustaining escapes from poverty. Sustained escapes are those which last — as opposed to falling back into poverty — and, ideally, show a continuing upward trajectory away from the poverty line. Successful farming increasingly takes place alongside diversification of livelihoods. Farm households do this in order to manage the risks they face. As such, policy and program linkages within and between agriculture and other sectors are needed to ensure sustained escapes from poverty. 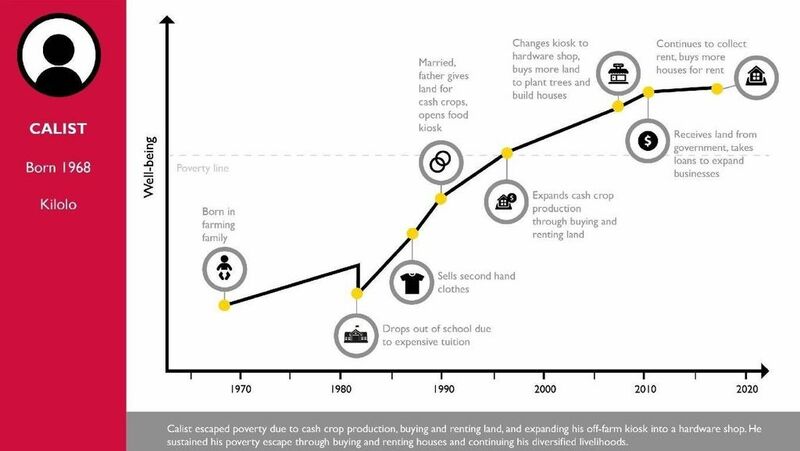 In a reducing number of contexts where land is still abundant, technology is available and markets work well, farming alone can still be the foundation for a sustained escape. Accumulating land is nevertheless important even where land is scarce, through renting or purchase to supplement the declining parcels of inherited land. Within farming, diversification of enterprises is also increasingly important. Investing in livestock is often as important as cropping but often greatly neglected in terms of service delivery and policy attention. For example, Gladys, a farmer in rural Malawi, has been producing and selling milk daily from a dairy cow she received through an NGO. One cow grew to three which came in handy when she had to sell one to meet loan repayments. Women-headed households who lose access to land on separation, divorce or widowhood find sustaining escapes challenging. For example, Acanit in Uganda recalls that her relatives tricked her by borrowing cattle and not returning them upon the death of her husband. Equalizing access to land and other property is an important policy measure, as observed in Ethiopia, where such dispossession was barely recorded, and Rwanda where it was also rarer than other countries. Both these countries have helped women manage such risks. For many households that escape poverty and are staying out of it, on-farm diversification often goes along with livelihood diversification beyond the farm, in the shape of off-farm/non-farm employment or self-employment, migration and/or urban investment. Calist in Tanzania sustained his poverty escape through buying and renting houses in urban areas and continuing his various diversified livelihoods. Diversification seems to be built into processes of escaping and sustaining an escape from poverty, rather than a consequence of an escape. On-farm and off-farm/non-farm assets and livelihood strategies are "converted" into sustained escapes by a number of enabling factors: collaborative spousal relationships, especially where spouses help each other financially, as observed in some cases in Malawi; social capital, which help with migration opportunities or paying for education as in Kenya or the Philippines; education itself (especially skills as noted in rural Kenya, often acquired as migrants); a financial inclusion ladder from savings and consumption loans to production loans (usually linked to nonfarm diversification), as in Tanzania; and risk insurance and security for farm and nonfarm businesses, as well as market and infrastructure development. This broad agenda means that a portfolio approach to programming and achieving critical links among policy initiatives are critical. Important future directions for resilience programming and policy-making include rebalancing support within agriculture with special emphasis on livestock and irrigation, and rebalancing support for smallholder farming with support for livelihood diversification and migration, both of which are relatively neglected areas in policy and programming. Then the next step is working out what the critical conversion factors are in a particular context and incorporating these into the intervention portfolio. These would include measures which insure against the major risks in each context.